When it comes to building a positive self image, there is probably nothing more important than developing a habit of positive thinking. In previous articles I have given you lots of mind power techniques and tools for developing self confidence and building self esteem. But the key to making any of it work, is paying attention to your thinking and making a concerted effort to be more positive. And the reasons are not just psychological, they are physiological too! can your thoughts change how you look? Typically when I talk about building a positive self image, I don't talk about how you look -- because that is such a minuscule part of who you are. But in my own personal experience, time and time again, when I feel happy and positive, people say: "You look great." Consider this: 50% -65 % of the human body is made up of water. If you direct positive thoughts at water, the molecular transforms into a beautiful snowflake-type form. Negative thought have a very different effect. Yes, highly peculiar isn’t it? If positive thought can do that to water molecules – imagine what it can do for you when it comes to building a positive self image AND perhaps even changing the image others have of you! Dr. Masaru Emoto - a doctor of alternative medicine - takes us on an intellectual roller coaster with his study and identification of the changes in water's molecular structure through the power of thought. He particularly emphasizes the impact that positive versus negative emotions have. Dr. Masaru Emoto has published several books on the power of positive thinking with regard to water and the implications that the knowledge of emotional changes in water could have; “Messages from Water”, “The Hidden Messages in Water”, and “The True Power of Water and Love Thyself” to name a few of his bestsellers on the topic. The studies that built the foundations of these books began with his travels around the world where he studied water and fostered his curiosities with regard to his initial thoughts about the potential power of thought on water. The experiments – which are now world renowned – began with bottles of water, a freezing device, a molecular microscope and the power of thought. Dr. Emoto and his team set to work in their laboratory in 1994 and what they began to observe was nothing shy of incredible. Using the same water – hospital distilled water – over and over again for the experiments, they found that positive words and classical music amongst other positive acts actually influenced the waters molecular structures. The water that was subjected to intellectual love, kindness, order and beauty formed into highly structured crystals that looked like snowflakes. When the water was subjected to negative thoughts and emotions, the opposite happened – the crystals became disfigured and chaotic with no particular order or apparent structure. Think about the past. The thoughts you've had about yourself, the things you say to yourself in the quietness of your mind. 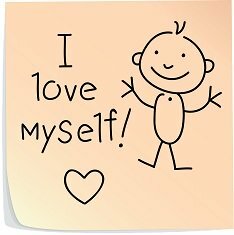 Are your thoughts about yourself helping in building a positive self image or a negative one? The implications of Dr Emoto's work are earth shattering. While we have all experienced “good vibes” and “bad vibes” and know that some people exhibit some of those energies more than others – the reasoning behind these intuitive feelings has historically eluded us – but, not any longer. Now we are closer to understanding the power of positive thinking more than ever before. And you can use this research for building a positive self image and making your whole life better. Without drugs, without psychotherapy, just your own mind power. “Positive, compassionate words comfort and heal; negative words and insults hurt. Until recently, we knew this only because we could feel it. Now we can actually see it." With the power of positive thinking you can begin building a positive self image, one molecule at a time. And as you do you can help to change the world around in a productive and beautiful way.